Time for another update on what’s going on around Folsom… First, let’s talk about water. Folsom Lake is at 83% of capacity, and this week’s storm is expected to dump up to 7 inches of rain in the foothills, melting snow, and sending all of that water down hill. Snow Pack Gets Huge Boost – Is it Enough? 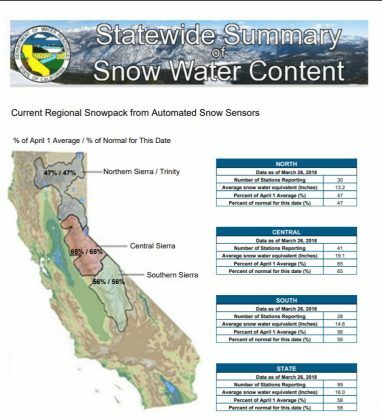 At the end of February, the Sierra Snow Pack was a dismal 22% of normal. The media and social networking sites were abuzz with predictions of gloom and doom. Then March came along, with a series of storms dumping massive amounts of snow, bringing the statewide average to 58%.